In the course of their work, our researchers have uncovered some material which doesn't conveniently fit with any of the other pages. As it is organised, classified and catalogued, it will be published here in the archives. Please check back here soon. "To all production staff. 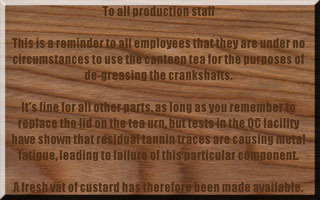 This is a reminder to all employees that they are under no circumstances to use the canteen tea for the purposes of de-greasing the crankshafts. It's fine for all other parts, as long as you remember to replace the lid on the tea urn, but tests in the QC facility have shown that residual tannin traces are causing metal fatigue, leading to failure of this particular component. A vat of custard has therefore been made available."